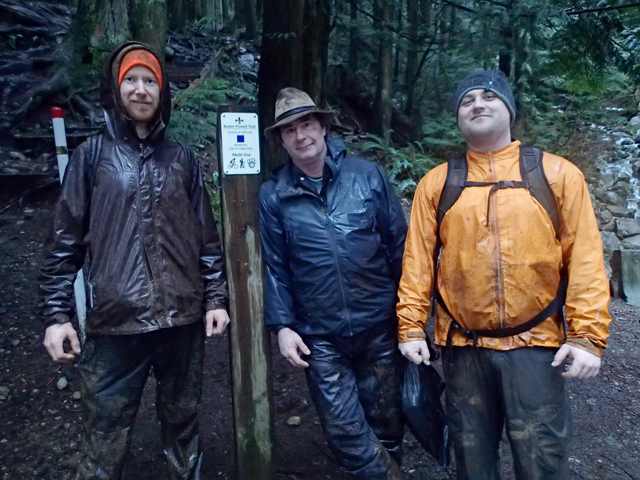 Thanks to funding from the CP Loewen Foundation, work is underway to restore the Baden Powell on Fromme. 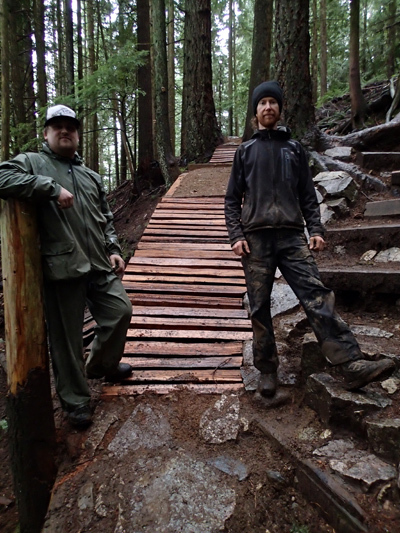 Work has commenced beginning at the Stairs of Despair and working towards the yellow gate on Fromme. The much needed work is led by the legendary Todd "Digger" Fiander with support from builders Peter O'Loughlin and Patrick Podolski. The last time significant work was done on the trail was led by Peter Morin and Matt Preston some 7 years ago. Much of the armouring is still in tact but significant erosion has taken place due to the popularity of the multi use trail. The work is especially challenging due to the topography and high usage by hikers and bikers. The steep wooden ramp installed in 2011 at the Stairs of Despair location has been replaced with a lessened grade and a dirt platform at the mid point to allow users to slow down mid slope. 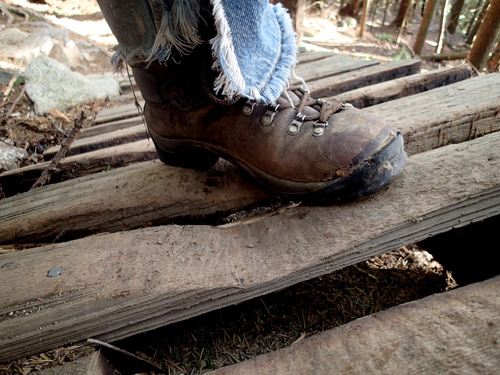 In areas where significant erosion has eroded the trail tread, cribbing and dirt work has brought the trail back to grade and water diversion and proper drainage installed to ensure the dirt work sticks. "It is a challenging project and there are few builders in the world up to the task, thankfully Digger has the experience and know-how to rectify the problems and turn back the hands of time." According to NSMBA Program Manager Mark Wood, the expertise of Todd Fiander is of particular value to the challenges faced in this difficult restoration. "Digger has been building on the Shore for over 30 years, no one has his experience to lead this project." The work is in its final stage as the crew make their way down the last, and possibly most difficult pitch to the yellow gate. Be sure to drop by over the next couple weeks to offer words of encouragement to Digger who will be working solo on this last challenging section due to the meticulous nature of the work in this area. It's rumoured cookies seem to fuel his efforts so be sure to drop by with some chocolate chip cookies if you're in the neighbourhood! The Crew: Irish Pete, Digger & Podo none the worse for wear after a hard day at work. 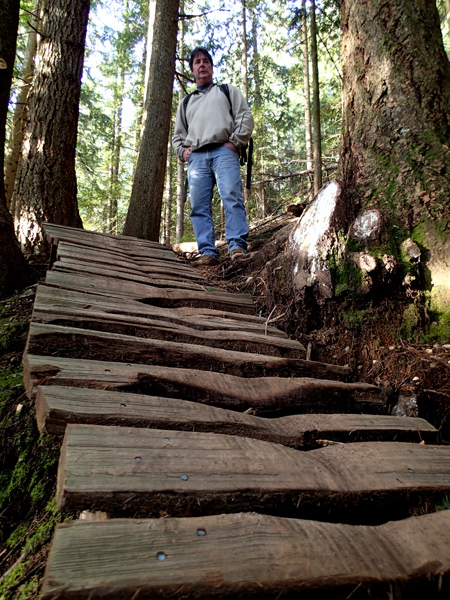 The steep ramp installed by the DNV Trail crew in 2011 was steep, deadly in the wet, and suffered severe wear from braking impact due to the steep grade. Some slats were nearly worn through after only 2 years. The new ladder bridge with a braking platform. Podo & Pete show off the goods they constructed, masterminded by Digger. An example of the restorative work that corrects alignment and improves user experience with some moss & ferns to add to the ambiance.